Summary: We present a patient with isolated intracranial mucormycosis that remained indolent for several months. The mucormycosis formed a mass in the prepontine cistern, probably spreading from the sphenoid sinus. We propose that at least some cases of what is considered isolated CNS mucormycosis develop from such unrecognized indolent infections. Mucormycosis may present as a mass in the basilar cisterns, especially in immunocompromised patients. Mucormycosis is an infection caused by fungi of the order Mucorales in the phylum Zygomycota. Rhinocerebral mucormycosis is the most common form of the disease. It typically develops in diabetic or immunocompromised patients and presents as an acute fulminant infection, which is often lethal (1–4). The Mucorales are saprophytic fungi frequently found in the upper respiratory tract and are nonpathogenic in normal hosts. The hyphae are broad and non-septated, with right angle branching, and are distinct from Aspergillus (2–4). When spores are converted into hyphae, they become invasive and may spread through the paranasal sinuses into the brain and orbits (1–3, 5). Direct soft-tissue invasion and formation of cerebral abscesses are frequent (3). Extension along blood vessels is followed by invasion and thrombosis. In addition to this classical fulminant presentation, a chronic form of mucormycosis exists (3, 5). Isolated CNS infection (6) and invasive rhinocerebral mucormycosis in immunocompetent patients have been described (7). We herein describe the clinical and MR imaging findings of a patient with intracranial mucormycosis that remained indolent for many months. A 16-year-old male patient with acute lymphatic leukemia was treated with unrelated bone marrow transplant and developed graft versus host disease. He had a history of recurrent sinusitis. During the treatment for graft versus host disease, the patient became febrile. He was given antibiotics, and his fever abated. However, 4 weeks later, a second febrile episode occurred and negative blood cultures were obtained. Amphotericin B was IV administered for 6 weeks. Eight months later, the patient experienced mental status changes and headache. MR imaging of the brain was performed, and the findings were interpreted as negative except for mucosal thickening in the paranasal sinuses. In retrospect, a subtle loss of clival bone marrow T1 signal was present (Fig 1A). After 3 months, the patient was again admitted with fever and headache. MR imaging of the brain showed decreased T1 signal intensity in the clivus, thickened mucosa in the posterior aspect of the sphenoid sinus, and a 5 × 8 mm mass in the prepontine cistern (Fig 1B). IV administered amphotericin B for presumed fungal infection was continued for 6 weeks. Follow-up MR imaging of the brain, performed 4 months after initial imaging, showed subtle increase in size and contrast enhancement of the prepontine cistern lesion (not shown). 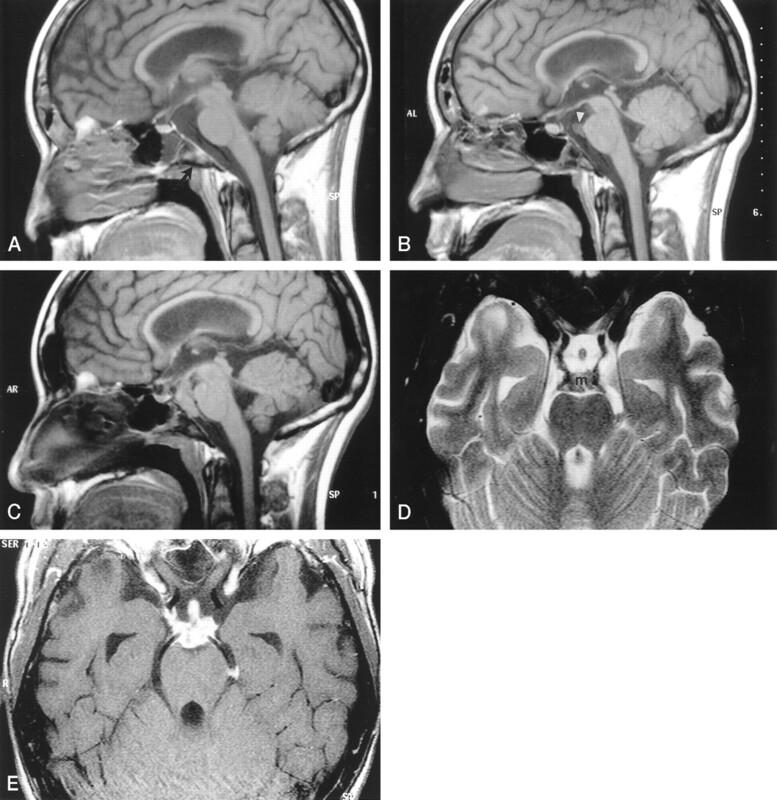 Five months later (12 months after the first abnormal MR imaging findings and 9 months after the prepontine mass was first found), a follow-up MR imaging study showed progression of the lesion, along with loss of T1 signal in the clivus and irregular posterior rim of the sphenoid sinus (Fig 1C–E). Biopsy of the lesion, performed to exclude recurrent acute lymphatic leukemia or graft versus host disease, revealed characteristic broad, non-septated, empty-appearing hyphae with right angle branching compatible with mucormycosis. IV administered amphotericin B therapy was again started. Three months later, the lesion continued to grow and the patient developed an infarction in the right middle cerebral artery territory. Images from the case of a 16-year-old male patient with acute lymphatic leukemia who was treated with unrelated bone marrow transplant and developed graft versus host disease. A, Midsagittal spin-echo T1-weighted image (550/12 [TR/TE]; matrix, 256 × 218; field of view, 230; section thickness, 5 mm) shows subtle areas of decreased signal intensity in the bone marrow (arrow) of the clivus. For a 16-year-old patient, the signal may still be heterogenous; however, this is more prominent than is usually seen. The prepontine cistern is normal. The sphenoid sinus contains a fluid level. The lateral ventricles are prominent. B, Corresponding T1-weighted image obtained 3 months after the image shown in A shows further decrease in signal intensity involving most of the clivus. There is mucosal thickening in the adjacent posterior aspect of the sphenoid sinus. A tract extending horizontally from this thickened mucosa through the clivus appears to be present. A small soft-tissue mass (arrowhead) in the superior aspect of the prepontine cistern adjacent to the basilar artery is seen. C, Image obtained 9 months after the image shown in B shows that the mass has grown and fills most of the prepontine and interpeduncular cisterns. The pituitary stalk is also thick. The bone marrow throughout the clivus is markedly hypointense, and there is mucosal thickening and an irregular rim in the posterior aspect of the sphenoid sinus. The ventricular size is unchanged. D, Axial view fast spin-echo T2-weighted image (5500/96; field of view, 200; matrix, 512 × 256; section thickness, 3 mm), obtained at the same time as the image shown in C, shows that the mass (m) is of low signal intensity and extends along the posterior cerebral arteries and posterior communicating arteries. The thick pituitary stalk is seen within the suprasellar cistern. E, Axial view contrast-enhanced spin-echo T1-weighted image (850/14; field of view, 200; matrix, 512 × 256; section thickness, 3 mm) shows intense enhancement of the mass and its extension to the pituitary stalk. The enhancing mass spreads along the internal carotid artery on the right and into the left ambient cistern. Classically, rhinocerebral mucormycosis presents as an acute, fulminant, and often deadly infection in diabetic or immunocompromised patients (1, 3–5). The common presenting symptoms are headache, fever, sinusitis, facial swelling, and unilateral orbital apex syndrome (1, 3–5). Findings on CT scans and MR images include dense opacification of paranasal sinuses with variable mucosal thickening and usually absence of fluid levels (1, 3). Sinus contents have variable MR imaging signal characteristics, from hypointensity to hyperintensity on T2-weighted images, probably secondary to the presence of manganese, iron, and calcium (3, 4). Extension of disease beyond the sinus walls is present in symptomatic patients, commonly without evidence of bone destruction (1, 3). Brain abscesses and infarctions tend to occur after involvement of the orbit and/or deep facial structures and sometimes by direct extension through the cribriform plate (1, 3). There is obliteration of periantral fat, pterygomaxillary fissure, and pterygopalatine fossa, or extension into the orbit and cavernous sinus (1, 3). Chronic invasive rhinocerebral mucormycosis shows slow progression over a period of months (3, 5). All patients with chronic mucormycosis present with signs of intraorbital or intracranial extension of the disease, usually with unilateral orbital apex syndrome and/or cavernous sinus involvement (5). Imaging studies show soft tissue extending outside the sinus walls, usually into the orbit (5). A case of mucormycosis affecting the skull base was described and showed evidence of direct extension from the sphenoid sinus (3). The incidence of mucormycosis has increased in patients with hematologic malignancies (8). This is probably because of the use of more aggressive chemotherapy that causes severe and prolonged neutropenia (8). Patients with acute leukemia seem to be especially prone to mucormycosis. The most common symptom is fever, occurring in 51% of patients (8). The reported cases of rhinocerebral mucormycosis in immunocompetent patients show a somewhat different pattern of disease when compared with diabetic and immunocompromised patients. In this group of patients, there is absence of calcification and a predilection for the ethmoid sinuses (7). Contrast enhancement, intraorbital and intracranial extension, and high mortality rates are similar among all patients regardless of the status of their immune system. Isolated CNS mucormycosis occurs more commonly in IV drug users and presents with acute onset and rapid development of neurologic symptoms (4, 6). The suspected source of infection is spores in the injected substances (4). Infarcts and abscesses are found on imaging studies, most commonly in the basal ganglia (4, 6). It is not clear whether these patients have true isolated CNS mucormycosis, because spread from the paranasal sinuses may not be recognized without dedicated high-resolution imaging studies. Our patient differs from those previously reported in that he remained asymptomatic with an isolated intracranial mass that slowly increased in size over several months. The slow growth of the mass and its isolated appearance are very unusual findings, which have not been previously reported in cases of intracranial mucormycosis. Also, all the described cases in which intracranial extension was seen on imaging studies were clearly symptomatic. We think that the mass represents extension from a sphenoid sinus infection through a grossly intact clivus. Mucormycosis may spread intracranially from the sinuses along perivascular channels despite an intact appearance of the sinus walls on imaging studies (1, 2). In one patient with mucormycosis affecting the prepontine cistern, the clivus was clearly eroded and there was direct extension of soft-tissue mass (4). For our patient, CT study of the sinuses could probably have documented clival erosion at the posterior rim of the sphenoid sinus, indicating a fungal infection. The patient had minimal and nonspecific symptoms, which are common features of patients with mucormycosis and treated acute leukemias (8). This relative lack of symptoms may be explained by a reduced inflammatory response to infection in neutropenic patients. In our patient, the prolonged and indolent behavior of the infection may have been due to repeated IV administration of amphotericin B. Because he was never given amphotericin-B intrathecally, the effective dose of the drug crossing the blood-brain barrier was probably not sufficient to eradicate mucormycosis but could have been enough to cause significant growth suppression. It is possible that at least some cases of isolated CNS mucormycosis develop from unrecognized indolent infection, probably extending from the paranasal sinuses. Mucormycosis is a rare cause for masses in the basilar cisterns, which should be considered, especially in immunocompromised patients. It should be added to the differential diagnosis that typically includes lymphoma, granulomatous inflammation (primarily sarcoidosis), and infection (such as tuberculosis). The presence of mucosal thickening or signal intensity changes in the wall of adjacent paranasal sinuses should raise the suspicion of mucormycosis. This suspicion may possibly be confirmed with a CT study of the sinuses and/or endoscopic sinus biopsy. It should lead to prompt treatment to avoid complications and the almost uniformly poor prognosis that is associated with intracerebral disease. Accepted after revision January 25, 2002. Disseminated mucormycosis in haematological patients: CT and MRI findings with pathological correlation.